now i know this is not exactly appropriate work attire but luckily for me i can get by with almost anything at work. i do get the occasional weird looks just because i don't dress like everybody else there, but i don't mind. leggings always make me so self conscious. i feel the need to constantly cover myself for fear of over exposing certain areas. but today i decided to take a risk and wore them with two long tank tops and a long cardigan (not pictured here). 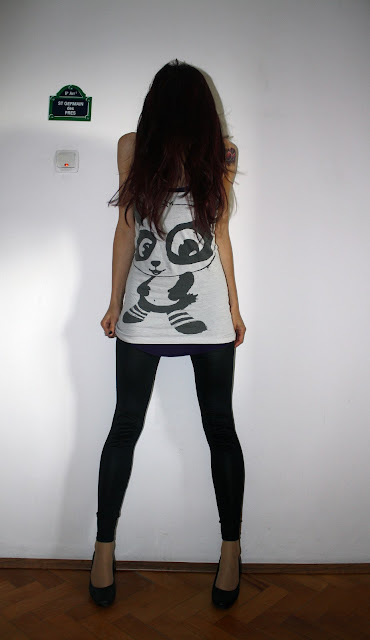 i was counting on the panda print to distract everybody's attention. not sure if i fully achieved that but at least it made me fell better about the hole thing. one other thing, everything i am wearing is new, by which i mean not thrifted. on one hand it makes me feel fresh and hip and cool but on the other hand i feel like i am cheating my wardrobe, most of which is thrifted. for some reason i always feel the need to incorporate at least one thrifted item in my daily outfits, it makes me feel i am a better person. SO COOL. This outfit is killer. And that first pic is killer!! LOVE it. You look GORGEOUS. ah! I love love love your tank. adorable everything!! You look so pretty! You can totally pull off the legging look; I could never! i so love what you are wearing, love love love it! my favorite outfit of you till date! I've just created my blog and I would love to have your feedback.